Sometime before the new year, Fountain City Roller Derby announced their 2016 schedule of home games, and the time is quickly approaching. Derby season is almost here! 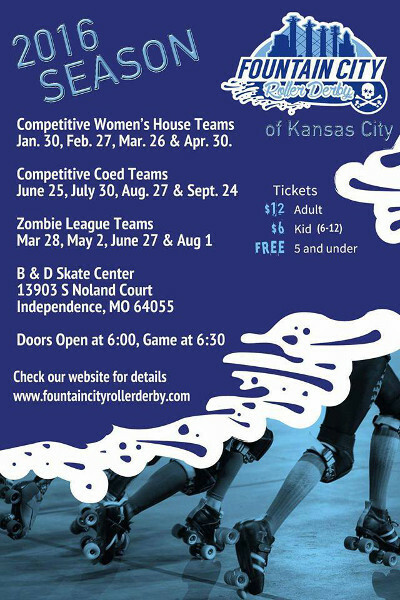 Stay tuned to KC Derby Digest, we’ll have much more information about the 2016 Kansas City roller derby season very soon, including a month-by-month breakdown of events and any date conflicts that may arise between leagues so you can plan to join your favorite teams trackside. For now, mark your calendars and get ready to join Fountain City Roller Derby at B&D Skate Center in Independence for another phenomenal season of flat track madness.